From August 10—16, BAMcinématek invites audiences to celebrate creative expression with “Women at Work: Radical Creativity”—the second installment of an ongoing film series dedicated to highlighting the complex subject of women’s work from a variety of perspectives. Following “Women at Work: Labor Activism” (March 2018), “Radical Creativity”—organized by guest curator Dessane Lopez Cassell—foregrounds the intellectual labor of women artists, activists, and thinkers. Often undervalued, or altogether overlooked, the contributions of women have had a profound and continuous effect on our cultural and political landscape, drastically shaping not only the way we visualize our world, but also the ways in which we experience it as citizens. “Radical Creativity” highlights the persistent efforts and agency of women in shaping culture, critical thought, and the governing of their own communities. The series opens with Kathleen Collins’ Losing Ground. A revelatory, semi-autobiographical film and one of the first fictional features made by an African-American woman, Losing Ground chronicles the tensions between a mismatched black couple—Sara (Seret Scott) a professor and writer who crackles with intellectual energy, and her impulsive, temperamental artist husband Victor (Bill Gunn). Avoiding the racialized clichés of its time, Losing Ground is a subtle, skillfully shot portrait of a woman grappling with the tension between her career and their relationship. Following the screening, Nina Lorez Collins will be at BAM for a conversation about her work spearheading the restoration of her late mother’s film, and enabling Losing Ground to finally screen in theaters—something denied at the time of its making in 1982. Over the weekend, “Radical Creativity” presents screenings of documentaries by filmmaker Shola Lynch—Free Angela Davis and All Political Prisoners, and Chisholm ’72: Unbought and Unbossed—each blending luminous archival footage with poignant interviews to explore the lives and work of these trailblazing organizers. 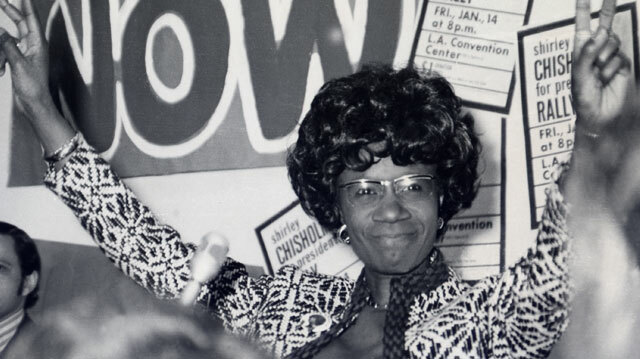 Chisholm was the first black woman elected to congress 1968, and the first to seek the nomination for president from a major political party. Examining her legacy feels particularly timely as we consider the record-breaking surge of women candidates who have entered the 2018 midterm elections. Two nuanced portrayals of adulthood—Marjane Satrapi and Vincent Paronnaud’s Persepolis, and Deniz Gamze Ergüven’s Mustang—offer revelatory portraits of what it means to come of age and struggle for a voice in one’s own community, while Wim Wenders’ Pina—a film focused on the ethereal and emotive choreography of German choreographer Pina Bausch—signals the series’ shift into considerations of artistry. In Looking for Oum Kulthum, artist and director Shirin Neshat (alongside co-director Shoja Azari) explores the legacy of the eponymous Egyptian musical icon through the lens of an exiled woman filmmaker, who wrestles with the challenge of representing Kulthum’s sacrifices as she grapples with plenty of her own. Michelle Parkerson and Ada Gay Griffin’s A Litany For Survival: The Life and Work of Audre Lorde, meanwhile, is an intimate portrayal of the literary giant at various points throughout her decades-long career. Through interviews with Lorde herself and fellow poets, activists, and friends, A Litany offers a layered account of the life and views of a queer icon and brilliant writer whose development of intersectional feminism was just one of many prolific accomplishments. Lorde’s insistence on continuing to work with the filmmakers even as she neared the end of her battle with cancer imbues the documentary with further resonance. Equally resonant are the films presented in Environments: Film Works by Ana Mendieta, which features a selection of works made by the multi-disciplinary Cuban-born artist. Best known for her hybrid and site-specific “earth-body” works, Mendieta’s films touch upon themes of spirituality, ritual, memory, and displacement. The series concludes with a special evening of shorts with New York-based filmmakers and activists Tourmaline and Sasha Wortzel. Celebrating queer and trans identity through a combination of documentary and experimental shorts, the program will culminate in the New York premiere of Happy Birthday, Marsha!—a creative, fictionalized account of a day in the life of Marsha “Pay it no mind” Johnson that combines archival footage of Johnson during her time in New York, where she became a well-known part of Greenwich Village. A pioneering activist for the rights and visibility of trans people, homeless youth, and AIDS patients, Johnson played a significant role in the Stonewall Rebellion of 1969, yet her legacy has only recently been recognized. Tourmaline and Wortzel will participate in a post-screening discussion about the film and their collaborative practice.